The amuse bouche was North Sea crab rolls topped with watermelon and palm heart, with tomato compote and dots of sardine cream and dill. Very nice combination, and I especially liked the sardine cream. Ebisu oyster with foie gras, croûton, Sauternes gelée and marmalade of apple - something extra that the kitchen sent out. Very light and interesting blend of flavors. Kumamoto Queen scallop, marinated with cider vinegar and served raw, curdled cream, Granny Smith apple and black winter truffle - wonderful scallop from Normandy. The slices of black truffle were almost as thick as the slices of scallop themselves... The acidity of the vinegar and Granny Smith worked wonders. There was also a little brioche on the side with another thick slice of black truffle, and some truffle butter. Guess who inhaled that in half a second? Taiyouran egg, stuffed with black winter truffle coulis, croutons and cappuccino of poultry broth - this was served without the broth, revealing the beautiful egg yolk in its full glory. Line caught turbot, maco artichoke purée, black winter truffle coins and veal bone marrow - interesting that the chef decided to give us a little bit of wing on the side. Love it that there were medallions of bone marrow here. There's plenty of artichoke here - between pan-fried artichoke and artichoke purée... and even the sauce is made with artichoke and truffle. Brittany abalone, oxtail chips with tomato provençal - another extra from the kitchen, and this was one of the highlights of the meal. The abalone was very, very nicely done, and the "chips" made with oxtail braised in red wine was just really interesting. And the tomato provençal initially sounded like a weird combination with the abalone, but together with the oxtail and all it just worked. Leg braised in a black winter truffle 'parmentier' and 'jus gras' - another winter warmer here, with heavier and stronger flavors. Carnerolli rice pudding with Bourbon vanilla ice-cream and table-side shaved black winter truffle - I had this at another fantastic lunch last year, and was very happy to have it again. Yup, this was gone in no time. A special occasion requires a special bottle of wine, and I am most fortunate to be able to call on the MNSC boys for help when there are gaps in my collection. 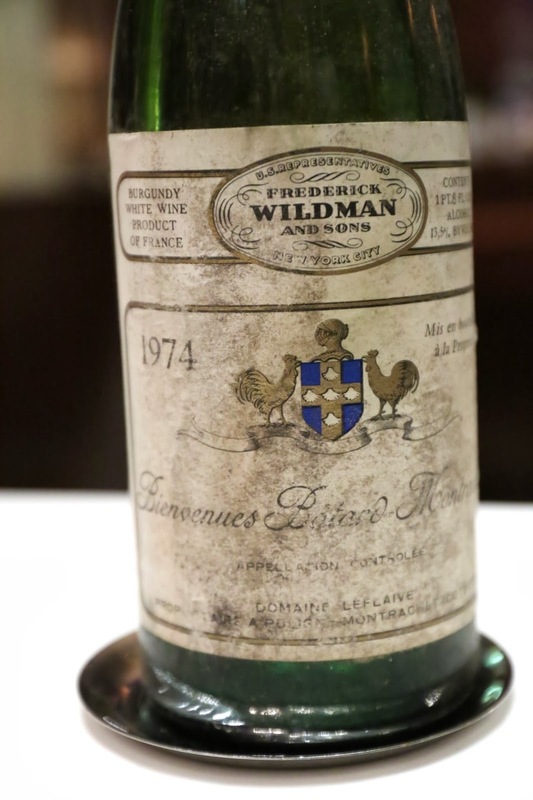 I am grateful to Curry for his willing to spare a bottle from his cellar. 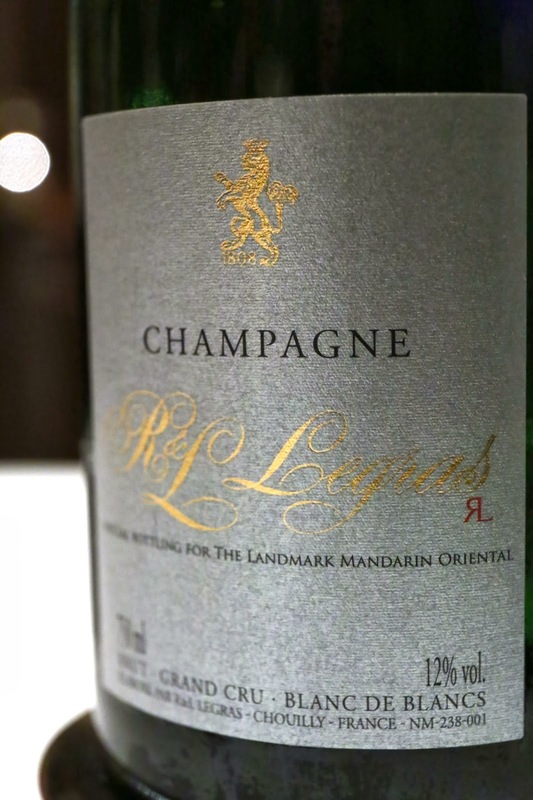 R and L Legras Brut Blanc de Blancs Grand Cru (bottled for the Landmark Mandarin Oriental) - nice and easy to drink. A little caramelized, yeasty, and later light toasty notes emerged. This was a generous gift from Chef Richard.